Karen Tanenbaum and Kevin Muise are presenting a very good paper on adaptive processes for guides working with families to promote social interaction (link). They undertook an ethnographic study of families visiting museums (primarily natural history) and then identified three challenges (opportunities surely) and developed 2-axis taxonomies for each of these which they applied to several exhibits. A study of a tangible device “ec(h)o” using Fishkin’s taxonomy (embodiment and metaphor). 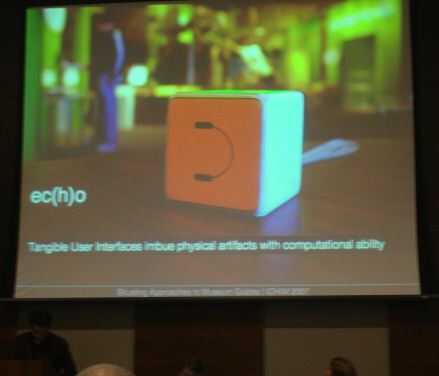 Tangible devices leverage natural objects like turning and moving the body into digital interactions. A taxonomy of individual/group, and visit flow (information delivery/game-interaction). Ec(h)o is game individual. Recent trends are to try to increase group interactivity. eg Archie. Challenge is to create engaging interaction between group members where engagement is with museum, not just each other or system. Types of adaptive systems and inferences they make (physical and content choices) to characterise users. 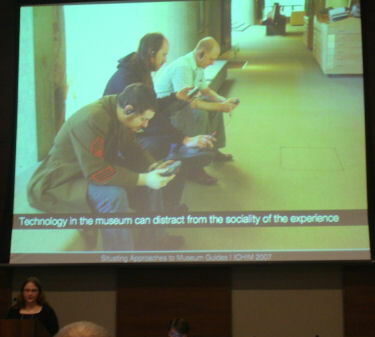 Static content versus personalised content (eg museum wearable at MIT robot exhibition). Types : greedy, busy etc. Interaction style: transparent or opaque. eg PEACH like-o-meter widget. Conclusion: shift to group interactivity supported by tangibility. Future research to examine group adaptivity – roles taken in group etc. Q: Complex infrastructures needed to support these ideas prototypes, will they be robust enough to support actual museum use, will the technology catch up in time for the shift to user generated material? A: Good point. A:Double-edged sword of design experimentation. A: Aim is for technology to dissappear- that is not going to change.